The thoughts I’d like to share with you today don’t arise from academic degrees or decades of experience in church music. They merely arise from watching, listening to, and participating in Reformed worship over the past several years. I’d simply like to encourage you through this class to think more deeply about why the church sings and how it can sing better. Right from the beginning I want to encourage you not to raise the objection, “We’re just not a musical church.” True, many factors may help one church sing much better than another—a big congregation, good acoustics, a large number of musicians, and so on. My home church doesn’t enjoy many of these blessings; maybe yours doesn’t either. But that’s okay. 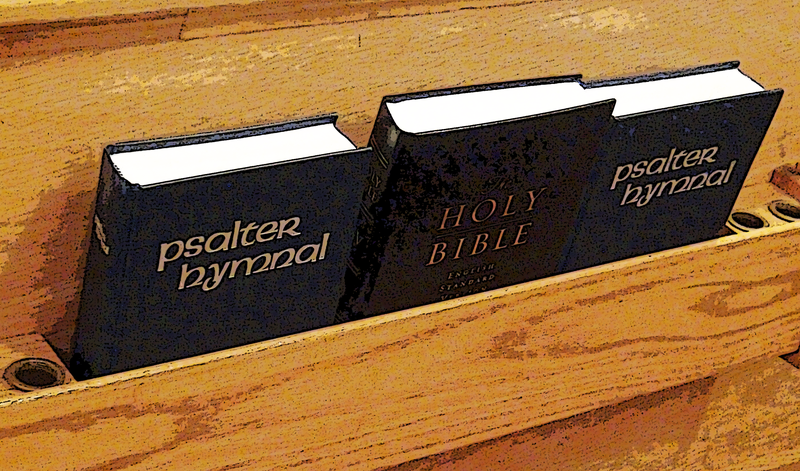 As an example, I want to point you to the congregational singing of churches in the Reformed Presbyterian denomination, one of which I attend at college. Every Sunday these Christians gather together and sing psalms a cappella as a congregation, and the heartiness and quality of their singing would put most of our churches to shame. Yet they probably have no more musicians in their congregation than we do. 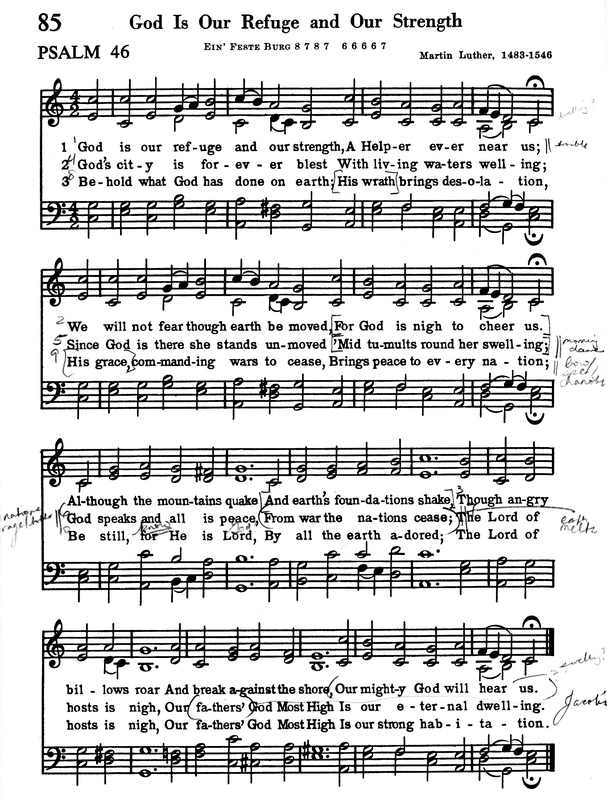 The difference is that they have developed a church culture that fosters a love for strong congregational singing: they teach their children psalm-singing from their youngest Sunday school classes, they encourage even non-musical people to learn to sing in four-part harmony, and they let the words of the psalms they sing penetrate their lives outside of worship as well. The results are truly impressive, and I believe denominations like ours can strive for that goal as well—but we need to start now. While I don’t know of many churches that can sing like this, I know of no reason why any church can’t sing like this. That’s my encouragement for you. Of course, there is a challenge as well: to think about why you sing in the first place. As a little diagnostic, ask yourself what you think about while you’re singing on a typical Sunday morning. I know I’m often disgustingly distracted: the pastor’s tie is crooked, the pianist is playing too slow or too fast, or some other thought is floating through my head preventing me from honestly engaging in worship. Occasionally this distraction is caused by circumstances outside our control. But more often, our attitude towards corporate singing reveals a deeper apathy in our hearts. To correct this perspective we need to return to Paul’s command to the churches in Ephesus and Colossi to “sing psalms and hymns and spiritual songs.” Yet for the Christian, singing is more fundamental than a command. Throughout Scripture, we see singing as a natural reaction of gratitude in response to God’s work of deliverance. One of the earliest examples of this pattern is found in Exodus 15, where Moses composes a song for the people of Israel to sing after the Lord brings them through the Red Sea. We see numerous other songs of deliverance throughout the Old Testament, sung by Miriam, Deborah, Barak, Hannah, David, Hezekiah, and others. In the New Testament, the pattern continues with the songs of Zechariah, Mary, and Simeon. And in Revelation 15 we are told that the multitude standing by the sea of glass “sing the song of Moses, the servant of God, and the song of the Lamb” (v. 4). I’ve often wondered what it means that these saints sing the song of Moses and of the Lamb. I’m no theologian, but I’m starting to wonder if the point of this verse is that the two songs are one and the same. The story of salvation sung about by Moses at the beginning of Scripture is the same theme taken up by the glorified believers around the throne of God in Revelation! As those who have been redeemed by Jesus from sin and death, we too have a part in this eternal song. Singing is a natural reaction to God’s work, and if “we are his workmanship” singing should be fundamental to the Christian’s identity as well. If this is the case, how dare I stand there on a Sunday morning before the living God who has redeemed me from my misery and called me into his presence to receive my worship—and I’m thinking about the pastor’s tie?! Such hardheartedness is ludicrous, and yet I have to be reminded of it daily. Christians, we should need no command to sing. It should already be on the tips of our tongues! Incidentally, not only is singing fundamental to the Christian’s identity, I want to suggest to you that it also distinguishes the church from the world. What other institution exists whose members (musical and non-musical alike) sing regularly and heartily? Maybe two or three generations ago, this would not have been such an uncommon spectacle. But today, as the church becomes more and more countercultural (or as the culture becomes more and more counter-church), its singing becomes more remarkable as well. We sing in response to the work of God in a way that the world cannot. That realization should be awe-inspiring!